Questions are being raised by human rights lawyers about the RCMP’s indiscriminate collection of the DNA of thousands of men in the remote Garden Hill First Nation in Manitoba. The DNA collection is the latest effort by the RCMP to solve the murder of Teresa Robinson, an 11-year-old who was killed in May 2015. Apparently, the Mounties have no leads on the case, and so have started going door-to-door asking every man aged 15-66 to voluntarily provide a sample of their DNA. Roughly two thousand men in that age range live in the fly-in community. 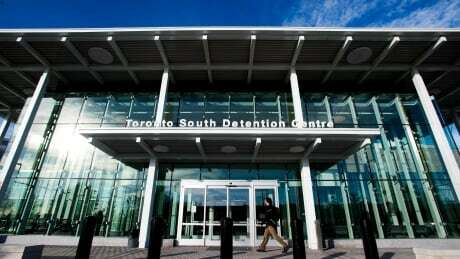 Image: a view of the front entrance of the Toronto South Detention Centre, a tall building with glass-panelled walls. A hunger strike at a Regina jail last week was just the latest in a series of high-profile protests by prisoners over the past six months, and underscored the crisis facing the Canadian prison system as it struggles to deal with the legacy of the Harper-era tough-on-crime agenda. Back in late 2010, when Stephen Harper laid out his new prison-building tough-on-crime agenda, critics were quick to point out a lot of flaws in his plan. They questioned the necessity of building new prisons at a time when crime rates were at an all-time national low. They questioned the wisdom of harsh mandatory minimum sentences for drug offences, a practice that many charge creates far more problems than it solves. They questioned the massive $2-billion price tag attached to the prison expansions and sentencing changes. They questioned the unnecessarily harsh and punitive approach taken by the Harper government, which overlooked research into proven successful measures like poverty reduction and increased support for people with mental illnesses. Those questions – including ones raised by senior researchers in the Justice Department – ultimately went unanswered as an omnibus crime bill was pushed through Parliament in early 2012.